Located within the Empire Stores building, a Civil War era landmark cargo warehouse in DUMBO’s Historic District, Sugarcane DUMBO is layered with history and culture. Celebrating the building’s unique past, the design approach minimally impacts this monumental space, maintaining an authenticity that reveals and celebrates the bones of the existing space. 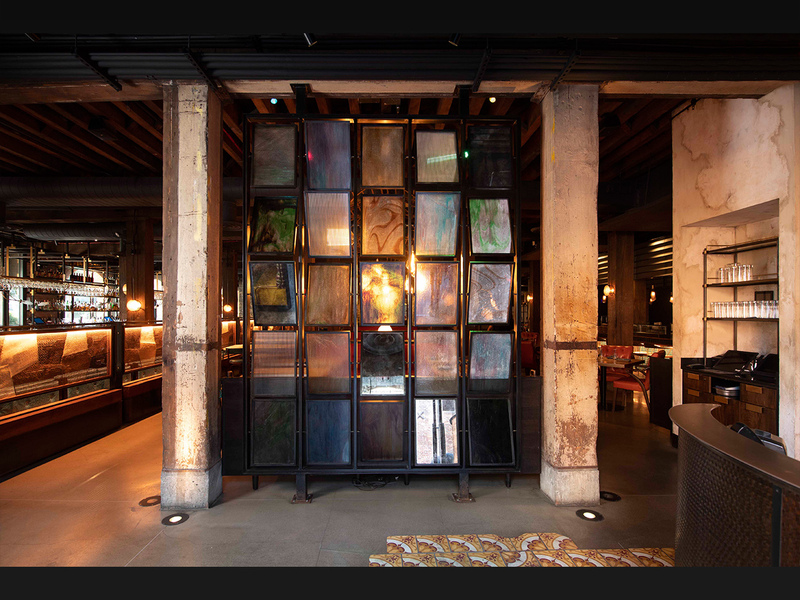 Two-foot thick schist walls, centuries old wood rafters, aged brick walls, abandoned rusty gates and monumental arched windows overlooking the East River are all highlighted in its adaptation. The varied cuisine and cultural influences that define the Sugarcane experience are expressed through the design of distinct bar areas including oyster, sushi, robata and cocktail. Curated metals of sculpted zinc, acid-etched bronze and hand rubbed steel are complemented by antiqued Cuban terra cotta and custom mosaicked tiles to provide a rich design dialogue. The private dining area, defined by a large communal table, made from wood beams found in the space, is nestled between a glowing 200-year old schist wall and a vibrant open kitchen; all lit by a custom chandelier that shows homage to cooking vessels from the kitchen.